Hey there, my name is Khevana and I am so grateful to Kimberley for letting me write a guest post for you guys. 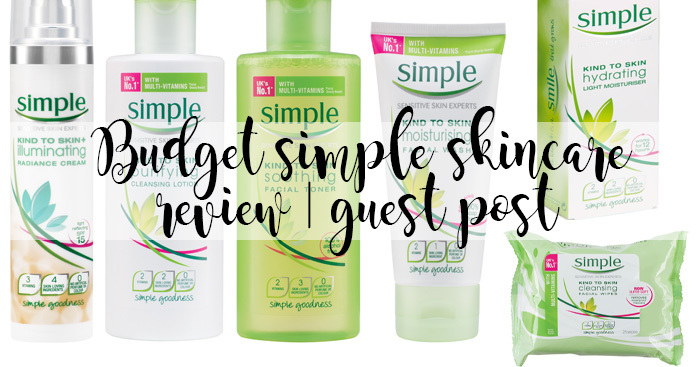 I’ll be presenting to you my top 5 favourite skincare products from the Simple range which is perfect if you’re living on a student budget! If you like this post then make sure you check out my other posts on my blog here. I have been using this face wash for a very long time and my favourite thing about it is the beads in it that exfoliate your skin. I tend to use this in the mornings and it definitely makes my skin so soft to touch and feels freshly cleansed. The beads can be very effective in exfoliation and therefore can have a drying effect so I wouldn’t recommend it as a daily face wash, maybe once a week is better. This face wash is something that I would recommend for your daily skincare routine. This one has no beads in it so it isn’t as rough on your skin; one drop of the product with wet face lathers very well so the tube lasts a long time. My face again felt very clean, fresh and oil free but it also felt a little tight, though this didn’t take too long to fade. I really like this moisturiser because of how oil free it makes my skin feel. It removes any visible dry patches but doesn’t’ make your skin feel as if it’s had a bunch of product slapped on it like other moisturisers do- it’s perfect to build up on with makeup. The package claims that there is no artificial scent but this isn’t necessarily the preferable thing because it does give the product a slight stale smell and I like my products scented- however if you have sensitive skin then scentless is the way to go! This toner did remove any residue of makeup or dirt and you could visibly see that, however I haven’t really felt any differences in my skin due to it. I used it with a cotton pad and put a couple of drop on it and rubes upwards on my face a few times and it didn’t feel too harsh and rough like I thought it would which was a plus! I was looking for something to help reduce my dark circles and I came across this is boots and thought let’s give it a go! Sadly, it didn’t do anything to my dark circles, however it definitely made my under eyes feels refreshed when I used it! This is perfect for those mornings where you lacked sleep (for me it’s during exam periods) or when your eyes are feeling a little tired throughout the day but you still have a lot of work to do because this gives your eyes a whole new life! I cannot describe the cool and light feeling you get when you dab it under your eyes and I 100% recommend this! I hope you enjoyed this guest post from Khevana, what's your favourite product from Simple? I love simple skincare, i have eczema so is so soft on my face! I've always been told my my Dr to not sure simple because it isn't a good skincare brand for acne prone skin. I'm probably going to try more of their products. I love Simple products too. I love the face wipes for an easy night time cleansing routine.